Tom Hough, retired vice chair of Ernst & Young, served as the keynote speaker for a Samford Professional Network event Feb. 7. 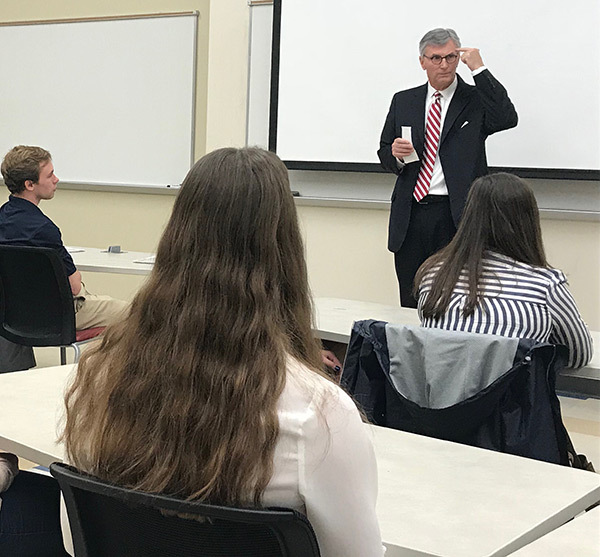 Samford’s Brock School of Business students, faculty and staff members, and alumni members of the Birmingham business community were present to learn insights from Hough’s 36-year career. Following the morning event, Hough spent an hour speaking to a class of junior accounting students. In the class, he shared six points of career advice that he has noted throughout his career: always remember where you were when, learn something every day, lead from any chair, why not me, learn about others, and attitude is everything.